Septic Tank Pumping. Should I? Is Septic Tank Pumping Necessary? Is septic tank pumping really necessary? . . . .Why do you change the oil in your car? To protect your investment and extend it's life, right? The same applies to your septic tank. Routine pumping of your septic tank protects your septic drainfield and will greatly extend the life of your septic system. Let me explain to you how a septic tank works and what happens when you don't pump your septic tank. Then you will understand why you should pump your tank regularly. The sewage from the house or building enters the tank through the inlet pipe and baffle. The baffle deflects the water and waste down into the liquid that is in the tank. There the solids and grease separate. The grease forms the scum layer on top of the water and the sludge settles to the bottom of the tank. In a properly maintained septic tank there is a relatively clear liquid in the middle that is called effluent. 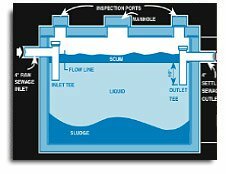 When wastewater is added to the tank the liquid level rises and the effluent flows through the outlet baffle to the absorption field. If you don't have your septic tank pumped out frequently enough, the effluent retention time is greatly reduced. What does that mean? . . . the liquid area between the scum layer and the sludge becomes to small and the solids don't have a chance to separate into scum and sludge. The result. . . solids get pushed out in to the distribution lines and clog the drainfield. I realize that not every one wants to know the details of how a septic tank works but you should know how frequently you should pump your septic tank. To determine what pumping schedule is good for your septic system there are two important factors. The number of occupants in the household. The gallon capacity of your septic tank. Click here to view the Septic Tank Pumping Schedule Table. Other reasons people pump septic tanks. 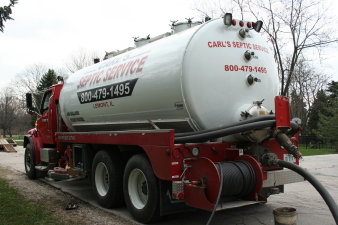 For more information or to schedule pumping, contact Carl's Septic Service, Inc.